Common Name: Knotty pine wood, Pine nodular branch. Functions: 1. To dispel wind and dry dampness; 2. To stop pain. 1. External injury pain. 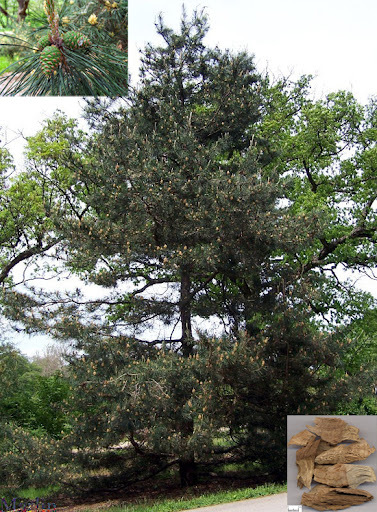 Pine nodular branch (Songjie) is used with herbs that invigorate blood circulation, including Peach seed (Taoren), Safflower (Honghua), Frankincense (Ruxiang) and Myrrh (Moyao). 2. Wind-damp obstruction syndrome. Pine nodular branch (Songjie) is used with herbs that dispel wind and dampness. In acute arthritis with severe pain, Pine nodular branch (Songjie) is soaked in wine for drinking. Dosage: 10-15 g, Proper dosage is for topical administration. Cautions: It should be used cautiously in patients with yin deficiency and blood dryness.